At The Bouquet Residence, indeed in the whole of the West Midlands – in point of fact, all over everywhere in England! – Tea is the beverage of choice. Whoever it was said ‘The sun never sets on the British Empire’ was referring, of course, to Tea. Because at any given time during each and every twenty-four hour period anywhere in the world where there are British subjects residing (and we are, most definitely, all over the place) you may rest assured somebody, somewhere, is putting the kettle on. What a comfort it is to know this! Tea is an all-purpose drink. It is always appropriate for any sort of occasion; you may drink Tea at any time of the day or night. Whenever Richard gets a sudden urge for an “Impromptu Midnight Snack” (See Chapter Ten: “Moments Miscellaneous and Musical: The Impromptu Midnight Snack”) he can be found making Tea. And it goes without saying that my hubby and I always begin our day with a nice hot cup of Earl Grey at breakfast (See Chapter Two: “Breakfast”). And, upon the odd “special occasion”, such as once a year on the day we celebrate our wedding anniversary, we have our Tea in bed in the morning. I always bring the Tea in to Richard as I don’t like him exerting himself on the day he’s giving me something special for our anniversary. 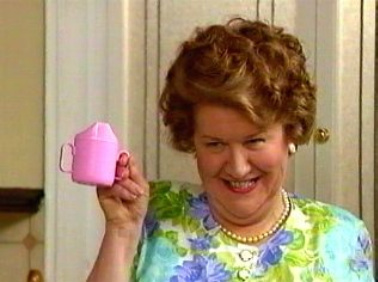 Of course my sister Daisy has brought her husband Onslow his tea in bed every morning of their married life. Or should that be every noon? I don’t think either of them ever gets up before lunchtime. But of course tea is not the only thing Daisy provides for her husband in bed. Why she’s forever grilling bacon for that man! My poor sister. I expect it’s the only way she can get that great oaf of an Onslow to wake up – waving one of those awful bacon butty things under his nose. I am sorry to say, having the benefit of my influence as a sister-in-law all these years, Onslow still has no taste whatsoever. I suppose it’s just as well. Daisy can’t cook anyway. There is one saving grace in their marriage, however: I am reliably informed by my sister Rose that Daisy has taken to playing music for Onslow when she brings him his tea in bed. Well, The Queen herself is piped awake and drinks her first cup of Tea of the day in bed so I suppose it’s good for Daisy and Onslow to at least try and follow suit, although I’m quite sure Her Majesty rises well before noon. At any rate, I myself don’t intend making a habit of drinking Tea in bed at The Bucket Residence. And you shouldn’t either. That being said, and as Richard and I have already been up for hours, I think now would be a good time for a second cup of Earl Grey. Richard, go out into the kitchen and make us a nice fresh pot of Earl Grey, will you. What do you mean we’ve already had our Tea? That Tea was for emergency purposes, Richard. And as it is now our normal Tea time, it is now time for Tea. Go on. Make the Tea. Look: Richard. You will please to remember I am writing a Better-Class Cookery Book here. My Readers are depending on me, Richard. I must not fail them! And I cannot think properly without my Earl Grey!! You’re supposed to be helping me, Richard. Whew. Richard’s finally gone off to the kitchen to put the kettle on. I don’t know where that man would be today without me to guide him. But that’s another thing Tea is good for: It gives unruly husbands an occupation, at least for the time it takes to make it. Richard is supposed to be helping me with my Cookery Book but all the morning long he’s been sitting here fooling around with his pencil, rolling it off his head and doing silly things like that. He counted up to 85 pencil rolls just a moment ago. Yesterday, he surreptitiously attempted to finish The Times crossword whilst he was supposed to be making notes for me on the manuscript of Chapter Four “Lunch” (See Chapter Four: “Lunch”). He thinks I don’t know what he was up to but I saw The Times crossword there on his lap – hidden beneath the manuscript of my Cookery book! It’s times like these I miss my Sheridan. First, phone your Water Board and ensure they’re piping the highest quality water into your residence. We went over that in Chapter Two: “Breakfast”, but it never hurts for the Water Board to be reminded of their duties. Next, fill your kettle with this quality water and bring it to a boil on your range. Depending upon the occasion for which you are making the Tea, you will choose one of several teapots, each of which is part of a coordinating tea set. If you don’t have at least two tea sets: one for every day and one for special occasions, then put this book down, go to your china shop and buy what you need to fulfill requirements. Then return home and re-commence reading -- and following -- these instructions. But a tiny word of advice before you go, if I may. It’s about china shops. I have received many queries over the years from people wanting to be like me who think having a set of delicate china with hand-painted periwinkles on is enough to do it for them. It isn’t. However, that is not the point I wish to make here. The point is – and this is a warning so pay attention, Readers! – There are unscrupulous china shop attendants “out there” who carry china with hand-painted periwinkles on. Beware. Because they will try to fob you off with false periwinkles. There is only one genuine antique heirloom delicate fine china tea set with hand-painted periwinkles on in existence. And it belongs to Hyacinth Bucket. I’m glad we’ve finally sorted that out once and for all. And now you have returned with your own bone china tea pot, let us proceed to fill it halfway with boiling water and “warm the pot”. Empty this water into your sink and then take your tin of Earl Grey in hand and put into your tea pot one teaspoonful of tea for each cup and one extra teaspoonful of Tea for the pot. Some people don’t think it’s necessary for the pot to have its own teaspoonful but I’ve never been one to scrimp at The Bucket Residence. And since you are relying on me for instruction, you should do like I do and give the pot its own spoonful. Now you may pour in boiling water, put the lid on your tea pot and steep the Tea five minutes. After which, you should stir the Tea and then you can pour it out into your delicate bone china cups, placing a tea strainer between the spout of your fine china tea pot and the cup so that your special guests may enjoy drinking their Tea without having to chew the Tea leaves. It’s very inner city, chewing Tea leaves. Back already with the Earl Grey, dear? How timely you’ve been, Richard! It’s uncanny how my hubby managed to prepare our Tea just at the moment I’ve finished telling you how to do it. I do believe Richard’s early retirement is doing him good. Either that or he was listening to my instructions whilst I was writing them down. I like speaking my Cookery book aloud as I write it. You see, I use Richard to gauge other people’s reactions and if he doesn’t get it, then I’ve wasted the afternoon. But anyway, here’s our Earl Grey so I shall pronounce this section on Tea making a resounding success! As I am something of a celebrity, locally, I have long felt it my duty to invite other ladies who are similarly prominent in the community to Tea. But no matter how important my other guests, I never neglect my dear friend and neighbour, Elizabeth. She always knows, when 3.25 rolls around every afternoon, where she’ll be: At The Bucket Residence, having Tea with the Lady of the House. I’m sure it’s a great comfort to her. She has so little of interest going on in her life, poor dear. Practically her only topic of conversation when we first met was knitting patterns. I’ve tried to bring her out of herself and give her something else to think about. And I do believe, in my own modest way, I’ve succeeded – to a certain extent. The girl has no social confidence whatsoever, so it is rather an uphill battle, I’m afraid. But we’re gaining on it! I use the afternoons when there’s nobody important coming to Tea to rehearse Elizabeth for the times when there are. Of course these are only practise sessions. The real dress rehearsals for my really important guests who come to Tea take place in the mornings whilst we’re having coffee. (See Chapter Three: “Coffee”). When I’ve only got Elizabeth coming to Tea, I like to keep the occasion as casual as possible. Elizabeth seems to cope better with casual occasions. The sort of casual occasion at which it’s all right to drink Tea out of a beaker. Elizabeth prefers her Tea out of a beaker. She always gets so nervous in the presence of my best bone. I learnt this the hard way, I’m afraid. I tremble to think how many of Grandmother’s hand-painted periwinkles have slipped through Elizabeth’s fingers over the years – it’s a wonder there are any left! Of course she’s no control over a beaker either but at least those are not forty pounds each and irreplaceable. Anyway, most of the time you’ll be in the kitchen for your casual Tea with a neighbour. And you may do like I do when you have your neighbour to Tea: Serve your Earl Grey (the only sort of Tea one should ever find on the premises of an upmarket household like mine) from your everyday china tea set. Provide milk and sugar for those who want it and if you’re feeling a bit festive, you may offer a plate of lemon wedges (accompanied by a fruit fork please!) Your biscuits are always the tinned sort and there is no need for the biscuit tin to display either the Royal Warrant or the Union Jack. Put a few biscuits out on a plate. And that’s all there is too it: A Casual Tea for a neighbour. Oh – and don’t forget the doily! When our new Vicar arrived, I overheard several members of the Ladies’ Circle discussing plans for inviting him to Tea. But who do you think had our new Vicar to Tea first – before anybody? Ah! You guessed. Yes, I should have felt remiss in my charitable – and religious -- duties had I not been the one to introduce our new Vicar into the social life of the community. It’s so important for a new Vicar to know who it is really matters amongst his congregation. The morning of my Vicar’s Tea, I had taken a break from waxing the leaves of my aspidistra to step outside into the front garden for a moment. I wanted to see if our roses had grown any during the night. They hadn’t. I don’t know why they’re not as large as those next door. I told Richard, I said, ‘I don’t like our roses not being as large as those next door, Richard. I’m having the new Vicar round for Tea and I wanted him to be greeted by a blaze of petal glory.’ Richard just stood there, leaning on his rake, and said our roses were a different variety from those next door. Totally unsympathetic! My husband was supposed to be raking leaves. That’s what I’d sent him out into the garden for. But he’d made very little progress as far as I could tell. There were old dead leaves all over the drive. I always think he’s out there working when all the time I suppose he’s been gossiping to passersby. I began collecting the dead leaves from the drive just as Elizabeth came out to retrieve her milk bottles. I took the opportunity to remind her to come for coffee (See Chapter Three: “Coffee”) so we could rehearse having Tea and Light Refreshments for the Vicar that afternoon. She was not as enthusiastic as one would wish but then it was still early. With her husband working abroad, Elizabeth is not the active Lady of the House I am. I went indoors then – but not – unfortunately – in time to prevent Richard from committing an unmannerly act upon my person with the handle of the rake. As the result of his inattention, I dropped all the leaves I’d been collecting for him so he had that much more to rake up as a result! It served him right. If he’d been watching what he was doing instead of chatting with Elizabeth, it wouldn’t have happened. I hope he’s learnt something from this. Later on whilst Elizabeth and I were rehearsing at coffee (See Chapter Three: “Coffee”). I sent Richard to the Wholesome Bakery for six Superior Fresh Crème Cakes. He had his task cut out for him there. They’ve no appreciation for persons of our social status for whom the timely delivery of Six Superior Fresh Crème Cakes for Tea with the new Vicar on a Saturday is a matter superseding the mere baking of bread. Richard hadn’t yet early retired and so he’d still retained his forceful and executive manner and I told him in no uncertain terms to bring it to bear upon the Wholesome Bakery. I said, ‘Be scathing, Richard. Crush them.’ Bakery personnel like that don’t deserve to be treated politely. As I believe you know by now, your Superior Fresh Crème Cakes are ones you’ve bought. And I hope, for your sake, your bakery knows how to treat persons who are upwardly socially mobile. Which, if you weren’t before, by the time you’ve got to Chapter Five: Tea, you should be. Discard the skin and bones from the canned salmon; flake the salmon with a fork. Put the knife blade in your food processor bowl; add the salmon, the smoked salmon, and the next 3 ingredients. Process this until smooth. Pour this mixture into a bowl; stir in the bell pepper and the next three ingredients. Cover the mixture and chill. Spread the salmon mixture evenly over bread and crackers. Top with alfalfa sprouts. If you don’t have a food processor, treat yourself and buy one. They’ll save you time, which as you know by now, is of the essence for a busy hostess. Richard bought me mine after that unfortunate fiasco with the leaf raking. He really must learn to control his gardening tools better. Preheat your oven to 400 F. Using a 2-inch round fluted pastry cutter, cut 2 circles from each bread slice. (Reserve the scraps for crumbs.) In a small saucepan, melt the butter and add the thyme. Brush the bread circles with this mixture. Place them on a baking tray and bake for 10 minutes, until golden. Meanwhile, combine the prawns with the cheese, mayonnaise, breadcrumbs, and salt. When the circles are cool, put a rounded Tablespoon of the prawn mixture on each. Sprinkle your Cheesy Prawn canapes with a pinch of dill and place under the grill for about 3 minutes. Heat the butter in a medium saucepan. Add the onions and cook over low heat for 2 minutes, then add the mushrooms. Cook until the mushrooms become tender (about 10 minutes) and stir in the lemon juice, salt, and pepper; set aside. Then, combine cheese, egg and cream with salt and pepper. Preheat your oven to 350F. Butter the bread on one side and place on a slightly greased baking sheet. Drop a dollop of the mushroom mixture onto each bread slice and top with 1 to 2 Tablespoons of the cheese mixture. Bake until the cheese mixture browns slightly. Serve Mushroom and Cheese canapes warm. There you have it, then – a lovely Tea any Vicar – and his charming wife, if he has one --would be proud to sit down with you on your three-piece suite and enjoy. The day my Richard early retired from a stellar career of working with the Town Council (Deputy Head, Department of Finance and General Purposes) I was prepared. Of course we’d had wonderful prior notice – we’d known before Christmas that Richard had been chosen for this honour. Yes, I shall always remember that day: The telephone rang; I answered it as I normally do, ‘The Bou-quet Residence! The Lady of the House speaking.’ But it was a call for Richard, which was very unusual as my hubby isn’t the sort of person to receive telephone calls. Any other time my private white slimline telephone with last number redials rings, it’s always for me. Unless it’s that unstylish Chinese Takeaway. They’d phoned that very morning, in fact, and I’d put Richard to ringing up the Chinese Ambassador to demand their number be changed. I will not have a Chinese Takeaway only one digit removed! Anyway, the reason I so vividly recall the day Richard was offered early retirement was because that’s the day Emmet and I were due to perform for the old people at the church hall. I had chosen several of my better musical selection and Emmet was going to accompany me on the pianoforte. (I save my really best best selections for my musical soirees (See Chapter Ten: “Moments Miscellaneous and Musical”). Anyway, I knew they’d love it! Everybody loves my ‘Annie Oakley’. But my goodness me here I am getting all wrapped up in my musical career when I should be telling you how to prepare A Formal Afternoon Tea (for entertaining an Executive’s Wife). I blame Richard. If he’d keep his mind on my Cookery book like he’s supposed to instead of attempting to finish The Times crossword, these things wouldn’t happen. What? What did you say, Richard? Whatever do you mean there’s nothing left of The Times crossword for you to finish? Oh my word, it looks like somebody’s coloured in all the little white squares…. Imagine the nerve of The Times crossword people sending out a puzzle like that! Well never mind, dear. Just take away the Tea things for me and then when you come back you can sit down here next to me once again. And have your pencil at the ready, Richard. Cut the crust off a loaf of fresh white bread and slice as thin as possible. (If you freeze the bread first and use a hot knife you’ll have better luck with this manouevre. Trust me.) Spread the bread with a mixture of cream cheese mixed with watercress (Remember what you learnt about the rarity of watercress – it’s imperative to have watercress on your menu if you’re entertaining an important executive’s wife.) Spread the filling all the way out to the edge of the bread. If you’ve frozen the bread as instructed you’ll need to go away and do something else now whilst you’re waiting for it to thaw. But as soon as it does (I have my Richard keep tabs on this and he notifies me when my bread’s thawed sufficiently) then is the time to roll the sandwiches. Hence the name: ROLLED SANDWICHES. Wrap these firmly and put them in the refrigerator till your guest arrives. Cut the pastry into 4 equal width strips. Upon the four strips place the following four different fillings. Saute 1 lb sliced mushrooms and 1 Tablespoon spring onion, minced. Combine this with 1 cup hot CREAM SAUCE (Over low heat, melt 2 Tablespoons of butter. Blend in 2 Tablespoons of flour. Stir in – slowly! – 1 cup of milk. Add a very small bay leaf and a small onion into which you’ve inserted 3 whole cloves. Stir the sauce with a wire whisk till it’s thick and smooth. Place it in a 350F oven for 20 minutes. Take it out and strain the sauce. After you’ve combined the CREAM SAUCE with the mushrooms and minced onion, season the whole thing with a little salt and paprika and a pinch of marjoram and 2 Tablespoons of dry white wine to taste (Be careful not to taste too much!). There. You’ve done it: CREAMED MUSHROOMS. (This is a MUST when inviting a Chicken Executive’s wife to Tea!) Combine 1 ½ cups cooked chicken, minced, with about ½ cup of the above CREAMED MUSHROOM MIXTURE) and you’ve got CHICKEN CROQUETTE MIXTURE. That’s all there is to it! See how easy cooking the Hyacinth way can be? Once you’ve got your four fillings placed on your four pastry oblongs, roll each one up like a jelly roll. Chill them in the refrigerator. Then cut them in ½ inch slices and bake them on a greased pan in a 425F oven till they’re a light brown in colour. Every hostess should have a superior chocolate cake in her repertoire. This is mine. Preheat your oven to 350F. Melt ½ cup butter and 4 ounces of chocolate in a double boiler. When this mixture is cool, beat (by hand – this is important not only for exercise but for the perfect outcome of your superior chocolate cake) 4 (room temperature) egg yolks (save the whites you’ll need them later) with ½ teaspoon salt and add to this egg mixture (whilst continuing to beat) 2 cups of sugar and 1 teaspoon of vanilla. Then quickly mix in the cooled chocolate mixture. When the whole thing is blended so that it’s all one colour, stir in 1 cup sifted all-purpose flour. Then beat the egg whites till they form stiff peaks and fold them into the cake mixture. Pour the batter into two 8-inch round greased layer pans and bake for a half hour. Cake is done when an inserted toothpick comes out with no uncooked batter clinging to it. When the layers are cooled, put them together with raspberry jam in the middle (buy this – it should have the Royal Warrant on) and cover the whole thing with whipped cream, which for those of you who don’t know it, you make by whipping 1 cup of whipping cream with 3 Tablespoons sifted confectioners’ sugar and ½ teaspoon vanilla). There you are then: A FORMAL AFTERNOON TEA (for Entertaining an Executive’s wife). With a menu like this, the success of your husband’s future career as an Executive is a foregone conclusion! The beauty of Tea is that it can be adapted to every purpose. You now know how to produce the perfect pot of Earl Grey and so you will always have that as the basis for your every social occasion where Tea is required. You know when you’ve only got a casual neighbour coming to Tea you can relax the rules a bit and serve simple biscuits from a tin. No need to go all out just for a neighbour. Save yourself for your more formal afternoon Tea when you’re entertaining an Executive’s wife. But not every important lady to whom you will be sending an engraved invitation to Tea will require inundating with your little selection of canapes and things to nibble on. In fact, it’s sometimes better if you don’t. A prime example of the sort of lady I’m talking about is Mrs Councillor Nugent. She is the no-nonsense type of person for whom even tinned biscuits are considered “over the top”. And it goes without saying you needn’t provide a bowl of sugar when you’ve got a Mrs Councillor Nugent coming to Tea. Lemon wedges fill the bill where she’s concerned. Perhaps, having surveyed your naked tea tray, you may feel an overwhelming urge to include – at the very least – a small dish of assorted Tea biscuits. But if you’re entertaining a serious Councillor it’s better than you don’t do it. Instead, assuage your artistic cravings like I do: By removing one of your more elegant (and very expensive!) objets d’art from your Queen Anne corner cabinet and placing it out in plain view on a side table. Busy Councillors may not have the appetite for your elegant cuisine; but I’m sure they can appreciate a Royal Doulton figurine when it’s conveniently situated at eye level. The whole point of inviting someone of the stature of a Mrs Councillor Nugent to Tea is so that she will see what a serious hostess you are, such that she can recognise your talents for serving on her Select Committee. But, to be on the safe side, I always station Elizabeth handily in my lounge so that she can answer any questions the good Lady may have about my stellar qualifications for the post she has in mind. I busy myself out in my kitchen during these crucial negotiations as I’ve never been one to boast of my talents. A Tea and Nautical Light Refreshments is even easier than a Serious Tea for a Mrs Councillor Nugent. You’ll particularly enjoy this one if you’ve got a yacht. I, myself, am so busy with my many charitable duties and social responsibilities that I rarely have time for yachting. It’s why Richard and I don’t have a yacht. Whenever we feel that innate response to the call of the ocean (we are British and the sea is in our blood!) we are fortunate that our son Sheridan’s friend’s father has a yacht. We once planned to spend an entire weekend aboard Contessa II. And we would have done so, if Richard had paid more attention to what he was doing. I’m afraid my First Mate turned out to be something of a disappointment to me upon the high seas. He is not the seasoned sailor one would wish, I’m sorry to say. It took him forever to start the thing and then once he’d done that he couldn’t stop it! And he had no understanding of port and starboard even though I was dressed perfectly for captaining the ship. Of course Richard was dressed for being First Mate, once I got him kitted out properly. But it seemed to have no effect on his yachting skills. But enough of my problems. Here is the menu for my Tea and Nautical Light Refreshments to which I invited not only my dear friends and neighbours, Elizabeth and Emmet, but also my sister Rose and her gentleman friend. I don’t ordinarily mix friends and family at my social entertainments but Rose had telephoned me whilst I was packing my set of matching executive luggage with the genuine leather embellishments and initials for our yachting weekend. She was all excited about her new gentleman friend and wanted to borrow my prayer book. It seems her new gentleman friend was quite religious. And so I thought it would be all right – just this once – to invite them both to join us for Tea and Nautical Light Refreshments aboard the Contessa II. With Rose’s religious gentleman friend aboard I felt Emmet would be quite safe. Richard didn’t seem concerned about Emmet; he was more worried about the sailing capabilities of Rose’s new gentleman friend. He said the man would need all the help he could get! My goodness me – whatever can Richard be thinking of? Just because a person is religious doesn’t mean he’s not at home aboard a yacht! Of course one wouldn’t expect him to be able to walk on water. Anyway, my hubby was totally in favour of me lending my prayer book to Rose. It brought tears to my eyes. I could just picture my dear sister, perched upon the bowsprit, reading prayers to her gentleman friend whilst our yacht lay at anchor within sight of a beautiful sunset and we all enjoyed our Tea and Nautical Light Refreshments. Hyacinth Bucket’s Country Cream Tea The first thing you must know about producing the perfect Country Cream Tea is that you won’t be able to do it properly unless you have a little place in the country for setting it up. If you don’t have a little place in the country like I do (Richard and I are part-owners of a Grade II-listed mansion) then you must commence looking at country property as soon as possible. Because it’s no good even thinking about doing a Country Cream Tea if you don’t own a place in the country. And lest you believe you can get away with leasing, I must advise against that. Leasing is something the lower middle-class sort of person does, a person like Delia Wheelwright (two storey, mock tudor, semi-detached at the corner of Oakdale Avenue; they’ve just added a games room above their garage.) She’s always boasting of her holidays abroad when it wouldn’t surprise me if they’d only taken bargain breaks at Bogner! And Bogner’s not even the country to begin with. Richard and I contemplated cozy charismatic country cottages for weeks before we settled on Marston Hall. We almost bought Honeysuckle Cottage – thank goodness we didn’t. Talk about lower middle class! The cottage itself was lovely of course. I could tell that by looking at the price in the advert. The moment I first clapped eyes on it I remarked to Richard, ‘One could do something with this. A little cottage furniture. It’s ideal for my Country Cream Teas.’ And I liked the name: Honeysuckle Cottage. I thought it would look rather well on our embossed personal notepaper: ‘The Buckets will be entertaining this weekend at Honeysuckle Cottage.’ I would’ve bought it in a flash if it hadn’t been for those next door. Driving up, we’d met a yokel on the road who – I think – gave us directions to Honeysuckle Cottage. I couldn’t understand a word he was saying and neither could Richard. He was a trifle off the latch if you ask me. But he seemed very taken with my hat. Of course that’s only to be expected. I don’t suppose he’d ever seen a hat like mine. But he was just staring at it. And his eyes were not the eyes of a vegetarian! I told Richard, I said, ‘I will not live in a place where they eat raw meat. It would make for very hard work at my Merry England Barbecues (See Chapter Eight: “Better-Class Barbecues”). Try and imagine the shock (!) when we discovered this yokel lived right next door to Honeysuckle Cottage! His place makes Onslow’s look like a palace. So anyway, we were saved from buying Honeysuckle Cottage in the nick of time. Instead, we bought Marston Hall. I bought it myself – on my own, actually. Richard had a civic duty to perform that day that involved Daddy and an executive sort of activity at the local police station. He was crushed he wasn’t able to go with me to look at Marston Hall but it couldn’t be helped. I had an appointment with the estate agent there and it’s not polite to cancel appointments with estate agents. Richard was concerned about who’d drive me but he’d no need to worry. I simply rang Elizabeth. She jumped at the opportunity to drive me to Marston Hall. Dear Elizabeth. I expect she saw it as a chance for a bit of excitement in her otherwise humdrum existence. Before I left, Richard cautioned me not to buy anything too large. He was worried I’d buy something he couldn’t afford. My husband has so little confidence! I reassured him. I said, ‘Richard. What have I ever presented you with that we can’t afford? ‘Sheridan for one,’ he replied. He will have his little joke at my expense. In the end, Richard was able to join Elizabeth and myself at Marston Hall. By then of course, I’d bought the place. Or part of it at any rate. We have a lovely penthouse apartment in a Grade II-listed mansion in the country. Who could possibly ask for more? Marston Hall took my breath away when I first saw it. ‘STOP! That’s IT!’ I said to Elizabeth. ‘Oh!’ I could hardly breathe, ‘I like it. I like it very much. One could entertain here. It’s ME, Elizabeth.’ Of course Elizabeth agreed. Later on, when I was being taken round by the estate agent, the whole matter was settled for me when I was introduced to Sir Edward. Our neighbour at Marston Hall. SIR Edward!! Our first night at Marston Hall is not something I wish to discuss in a section about Country Cream Teas. We’ll get to it later on (See Chapter 10: Moments Miscellaneous and Musical, ‘The Impromptu Midnight Snack’). For now, let’s just say Richard and I went through a tiny little period of adjustment as we were learning our way round my compact kitchenette. But on Day Two at Marston Hall, I rang Elizabeth first thing in the morning. I said, ‘Elizabeth! This is Hyacinth here, dear. Speaking to you from The Mansion!’ I invited her and Emmet round for cucumber sandwiches and – you guessed it! – my Country Cream Tea. I told them to wear something country, but smart. They more than met expectations, I am happy to say. Butter the bread lightly. Arrange slices of cucumber on the bread so that they overlap slightly but do not pile up in any particular place, as this gives a vulgar appearance. Lay a second slice of buttered bread atop the first and press down slightly without leaving hand marks. (This is tricky but, with practise, you will be able to do it almost as well as I do.) Trim the crust ¼ of an inch around and cut diagonally. Arrange the sandwiches on a plate (don’t forget the doily!) and sprinkle with the mustard cress. Preheat your oven to 375F. Grease and flour the bottoms of two 8-inch cake pans. Put the butter in a bowl and beat it until it is soft and creamy. Add in the 9 ounces of sugar and continue to beat until the mixture is light and fluffy. Beat in the eggs one at a time and mix very thoroughly. Add in the vanilla essence and mix. Sift in the flour slowly, folding into the mixture with a metal spoon. Divide the mixture equally between the two cake pans. Place the pans in the center of your oven and bake the sponges for 30 minutes until the sponge is well risen. Remove the pans from the oven and allow the sponges to cool for 5-10 minutes in the pans. Remove the sponges from the pans and allow them to cool down fully on a rack. When the sponge is cold, take one and turn it upside down on a serving plate (a delicate cut glass plate lined with a doily is excellent for this purpose.) Spread the sponge evenly with jam and place whipped cream on top. (See page 78 of this Chapter for how to whip cream in case you forgot.) Cover the jam and whip creamed sponge with the second sponge and sprinkle with 1 teaspoon of castor sugar. Using a pastry blender, cut the butter into the flour and salt until the mixture resembles whole meal. Add the sugar, baking soda, and cream of tartar. Mix well. Beat the eggs with the milk and add to the flour to make a spongy mixture. Place the dough on a well-floured work surface and pat it out to ¾-inch thickness. Cut the dough into rounds with a biscuit cutter. Place the rounds on a baking pan and let them sit for 10 minutes. Bake them in a preheated oven at 450F for 8 minutes. This recipe makes a dozen scones. If you’re expecting a crowd, double the recipe. Boil 2 cups of sugar, 1 cup of water, the rind of 2 lemons, and 1/8 teaspoon salt for 5 minutes. Cool this syrup and then add the juice of 6 lemons. Strain the syrup. For each glass of lemonade, mix 2 Tablespoons of this syrup per 1 glass of cold water. Emmet loves my lemonade. If he can manage to drink it before his sister Elizabeth spills it into his lap, causing untold damage to my new cottage suite, to say nothing of the ceiling of my lounge! Anyway, there it is – the perfect COUNTRY CREAM TEA! After you’ve gone to all the enormous trouble of preparing a superior Country Cream Tea for your select friends; after you’ve spared yourself no expense in preparing a Formal Afternoon Tea (for Entertaining an Executive’s Wife); after you’ve achieved your usual triumph by being first to surround your new Vicar with Tea and Light Refreshments; after you’ve withstood the rigours of preparing a Serious Tea for a Mrs Councillor Nugent; after you’ve prepared a Casual Tea for a Neighbour even though it puts your Royal Doulton with the hand-painted periwinkles in jeopardy; and after you’ve gone overboard in your preparation of Tea and Nautical Light Refreshments (with Ships’ Biscuits), then there is nothing quite as relaxing to look forward to as Tea at Home with Your Husband. I do so enjoy sitting down to Tea with my Richard. When I’m not otherwise engaged with one of my many enormous social responsibilities. Richard does so appreciate a nice cup of Earl Grey after he’s been out trimming the shrubbery in my front garden. Of course, even if he is at the front, I make him come in at the back. I don’t allow shoes of any sort in my front door, so it should be obvious that gardening shoes are forbidden. I’m afraid Richard too often forgets this house rule. One would expect him to remember after that fiasco back in 1968 when he put a footmark on my highly polished woodblock. That wasn’t in the house we live in today – and thank heavens for that because I never could remove his footmark entirely. I shouldn’t have to remind Richard of these things when he’s been out gardening and I call him in for Tea. It’s bad enough that he raises his arms and waves to passersby with dirty gardening gloves! Men can be impossible sometimes, when you’re trying to run an orderly household. But be that as it may, I know my wifely duty. And no matter Richard’s trespasses, I shall always make him Tea. Unless I’m busy becoming a world-famous Cookery Book Author. In which case Richard makes the Tea. But it should never be said that Hyacinth Bucket neglects her husband. Yes, I am proud to say my hubby has never, in our more than 35 years of married life, had cause to feel deprived. No matter what I’m in the middle of, when Tea time arrives, Richard knows one of us will be there, putting the kettle on. The day we were invited to a cheese and wine at the Art Gallery is a prime example. Richard had brought home some books from the library for a little quick study before the show. I, myself, had no need to brush up on art that morning, not with a son at University studying advanced needlework and tapestry design. And too, I am quite artistic, as anybody who knows me will testify. I don’t care for the modern rubbish, of course; but I do like a frame that doesn’t gather dust. Anyway, Richard seemed to be giving rather a lot of attention to one of his art books, too much attention, if you ask me. I put it away as it wasn’t very nice. Men sometimes have rather questionable taste when it comes to appreciating art. You already know how to make Tea (See ‘Making the Perfect Pot of Tea’ above) and the Spice Cake with Nuts is something you can buy at your local market. No need to go to a lot of trouble when you’re only having Tea with your husband. Besides, no sooner did I put the cake in front of Richard than I had a sudden flash of insight and I knew where Daddy was! He’d gone off that morning for love of Mrs Clayton. So where else would he be, but at Mrs Clayton’s! ‘Come along, Richard!’ I said. ‘We must go to Mrs Clayton’s and get Daddy!’ Which, of course, we did. Daddy was there, as expected. We took him with us to the Art Gallery. I put Richard in charge as I rely on him to keep Daddy away from any nudes. There you are then. We’ve taken you through the delights of Breakfast with The Buckets, Coffee (“in” and “out”), Lunch (everywhere), and Tea for any occasion and every occasion. But it’s very late and Richard’s beginning to flag. Of course I’m the one’s had the strenuous day of Cookery Book writing but I’m afraid Richard is not a high-energy sort of person and I do try and see to it that he gets his proper rest. At any rate, we shall bid you good night now. Get a good night’s sleep, Dear Readers. See you in the morning! Good grief. HOW could I have forgotten SHERIDAN’S LITTLE FAIRY CAKES! They’re the whole climax of my Cookery Book! It’s your fault, Richard. Yes, I’m afraid it was, so don’t try and come up with excuses. It was all that fooling around you did with your pencil. Rolling it off your head like that for consecutive counts. You know I can’t write my Cookery Book properly when you’re not paying attention. You distracted me, Richard, and interrupted my train of thought, and my Readers almost lost SHERIDAN’S LITTLE FAIRY CAKES as a result! Well no matter. What’s done is done. I’ll just stick them in here at the end of Chapter 5: TEA. Thank heavens SHERIDAN’S LITTLE FAIRY CAKES are TEA time treats. Come to think of it, SHERIDAN’S LITTLE FAIRY CAKES are probably best saved for last in the Chapter 5: TEA. TEAtime, as my Readers all know by now, is any time. I hope you haven’t dropped off to sleep yet. Because I’ve added SHERIDAN’S LITTLE FAIRY CAKES in here at the end of Chapter 5: TEA. They’re all-purpose, you see! They can be inserted into any menu where Tea is served. (Not, however, recommended for a Mrs Councillor Nugent). Ouch! Richard, stop that. That’s not funny, dear. I was talking about pinching the salt! Look, Richard. Go back to bed, dear. This is not the time for frivolity. I have important Cookery Book Authoring to do here. No, it’s all right. Go on. I shall finish up SHERIDAN’S LITTLE FAIRY CAKES on my own. Men. They’re all alike, early retired or not. Richard has absolutely no appreciation for the strenuous demands made upon a world-famous Cookery Book Author – why the creative muse can strike any time of the day or night! Next time I shan’t bother to wake him and he can just wait and read the more stunning parts of my Cookery Book after it’s published, like everybody else. Now. Where were we. Oh yes, the icing. Now you’ve got your ingredients organised. The next thing you’ll want to do is preheat your oven to 400 degrees. In fact, you may want to do that before organising your ingredients because it may save you time in case you’ve got an oven that’s slow to warm up like mine sometimes is. I must make a note to consult my Electrics Man about this next time he pops in (after he’s removed his shoes of course). Next you’ll want to arrange 12 double-thickness paper cases on a baking tray. Then beat the butter and sugar until the mixture is pale and fluffy. My Sheridan loves this pale and fluffy part! But be careful because spillages can sometimes occur during this procedure. Sheridan is frequently over enthusiastic in the kitchen. My son is a brilliant boy, but I’m afraid he does tend to spill things and leave traces of ingredients about and his FAIRY CAKE mixture too often gets all over everywhere! It’s why I took a dollop of it to the Kitchen Outfitters to test on their work surfaces when we were buying a new kitchen. One doesn’t like investing in new kitchen work surfaces if one doesn’t know how they cope with spillages. So anyway whilst you’re doing the “pale and fluffy” manouevre, watch out. Beat in your chosen citrus zest, followed by the egg. Sift the flour and salt (never mind the pinching!) into a bowl. Using a metal spoon, quickly fold the flour into the butter mixture followed by a Tablespoon of your chosen citrus juice. Spoon the mixture into the paper cases and bake them for 15 minutes until they are well-risen and golden. If you press SHERIDAN’S LITTLE FAIRY CAKES lightly, and they’re done, the sponge will bounce back! Cool SHERIDAN’S LTITLE FAIRY CAKES on a wire rack. Sift some icing sugar into a bowl. Add some of your chosen citrus juice into the icing sugar until it forms a thick icing. Dip your knife in hot water and carefully spread the icing over the top of each of SHERIDAN’S LITTLE FAIRY CAKES. It will creep further down each cake as it sets. Once firm, gently press in your garnish. You can pack these (for Barbecues and Picnics and things – See Chapter 8: Better-Class Barbecues and Chapter 9: Picnics) but remove the extra paper casing first. And always store SHERIDAN’S LITTLE FAIRY CAKES in an airtight container as SHERIDAN’S LITTLE FAIRY CAKES are best eaten either on the very day of baking or no later than the following day.